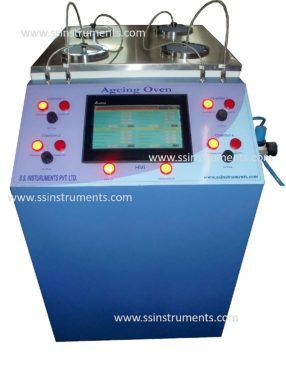 Ageing Oven (HMI / PLC Control) - S.S. Instruments Pvt. 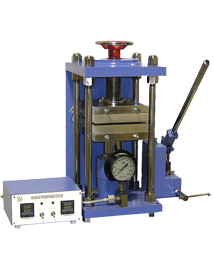 Ltd.
Thermoplastic and Electrometric substances when exposed to heat undergo many types of physical and chemical changes. The extent and type of change that takes place depends upon the severity of exposure of the sample to heat (i.e., temp. range), duration and rate of air flow. Packing : One Wooden Box, 45 x 32 x 52 (LBH in inches), Weight 200 kg. A 10″ touch screen (HMI) is provided to control and Monitor the instrument. 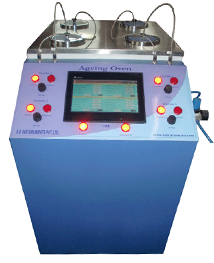 The HMI has various screen for control and monitor of the instrument using different parameters. Initially the operator is promoted to set the values using ‘Input Panel’ through HMI. The operator can then monitor the each chamber using ‘Test Panel’ wherein all the set and present values of the parameters are displayed. The parameters are also displayed using graphical and data representation. Digital Temp. Indicating Controller with sensor. Temp. range 0-200 ± 2 oC. Digital Flow meter for controlling the volume of air passing through the chamber. Main Control Panel with all four test chambers working. It display current values for all the parameters.